Hindsight is 20/20, so it’s easy for us to look back at the original Star Wars trilogy and look at it objectively. However, back in 1979, all you could do was form theories and guess where the story was going. We didn’t even have Empire yet. 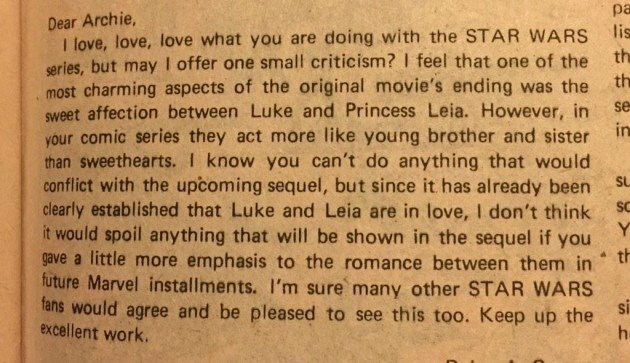 So, given what we know about the Star Wars movies now, this letter to the editor of Marvel’s Star Wars comics is pretty funny. Basically, the writer enjoyed the Luke-Leia romance and is wondering why there isn’t more of it in the comic books. I totally get this, since my Luke and Leia action figures made out non-stop until Empire came out, then they just kinda looked at each other, puked a little and awkwardly went their separate ways.